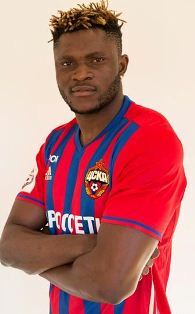 Super Eagles striker Aaron Samuel is in tiptop condition and has resumed full training with Russian Premier League side CSKA Moscow ahead of the new season which begins on July 15. Samuel has set himself targets for the 2017-2018 campaign, stating that he has put his injury worries behind him and wants to become the best player on the team. ''I will do everything possible so that I score my first goal in an official match very quickly after returning to CSKA . ''All strikers need goals. I am not bothered about how many goals I want to score in a season, I prefer to move to my goal step by step. Aaron Samuel earlier confessed that he has a burning ambition to play for Premier League champions Chelsea, adding that they are his favourite club.